I have digitized about 10 years of videos I have shot and now uploading all of it to a 20TB file server I have built. My question to any one out there that has organized a ton of videos is: "What is the best application to organize videos by custom categories?" My main concern is I want to perform this task only once. Therefore, what is really important to me is to use an application that is mature. I don't want to spend hours and hours buiding a data base and then a couple of years from now I have to do it all over again because a better application comes along. Is Microsoft Access a good choice? If not, can any one out there recommend a better option? I have a bunch of Wedding videos I woould like to organize by what I'm estimating to be at least 20 different categories. Therefore, I would like an application that is not labor intensive when it comes to applying custom categories to videos. What would also be cool is if I could launch the video to play from within the data base application. Also cool would be if the app could import screen capture stills from the video. Any information will be greatly appreciated. Thank you. I can`t suggest a particular program for you. But for a database where you want a number of custom categories, you want flexibility, obviously. The program is not going to be able to guess what you want. The thing about databases is that you have to have a clear idea of how you want to organize it before you start. That`s where the real work is, and no program can do it for you. If you don`t design it right and have to change it later it`s going to be a lot more work than designing it right in the first place. Thanks Hoser Rob for the post. Has anyone out there tried this app called Videonizer? I have looked at the tutorials. The app still looks like it's still under development and not mature yet. The tutorials are not helpful since they contain no audio instruction. If anyone out there has tested this app out, please post a comment on whether it would be smart to spend scores of hours building a video clip database using this software app. Also has anyone out there worked at a TV News station? What software app do they use when they have a need to replay and therefore find a 5 minute video clip that was aired 3 years ago? I'm sure they are using some kind of video organizer database that has all kinds of video clips catalogued. What app do they rely on for fast retrieval of any video clip they need to find among thousands of video clips? Any help will be greatly appreciated. Next you can search for combinations of these criteria using smart playlists. But I am somewhat unhappy with the way playcount is tracked. Playcount is only updated if you watch a video till the end. Does somebody happen to know an alternative program that tracks how many hours I spent watching a video instead of the number of times? This information is rather important to me since it's an accurate indicator which videos I enjoy. Last edited by Freek; 14th May 2012 at 11:42. All cel phones can now shoot video. This Apps latest features make good use of those capabilities. Video cataloging is completely different from Pictures. There are many segments in a video that may need explaining; from the perspective of shooter. RAW video doesn't include the whole story. And you can seldom verbally explain things on the fly. So large text with the video is the answer. It's easy to skip the text to just watch the video. Being able to randomly sample these video segments along with the textual details; helps keep you in touch with your digital info. http://www.youtube.com/watch?v=EzULqlf8598 (Slow Motion Demo and Faster Than Sight Objects) Check this demonstration out. The Time-Line Playback method requires no editing; so you only have the original videos to catalog. No mess of tiny video snippets cluttering up your computer. What a powerful training / teaching tool this app is. http://forums.thedailywtf.com/forums/t/13917.aspx A thread titled "Nobody shares knowledge better than this"
The thread goes on for over 2500 replies. Everything you need to know about control and access to your digital data is there. When you have lots of data like you do there is a need to randomly sample it now and again to stay in touch. Video without comments quickly lose their relevance. I am the author of Videonizer. The application has been improved a lot since that times. I am going to record new tutorial/demo clips. Last edited by VideophileII; 12th Mar 2013 at 07:30. GOOD NEWS regarding upcoming Video Software that isn't the same old cookie cutter table of fields and fancy thumbnails: I just realized your inital thread was 2009. I hope you found a video organizer. The big problem with video organizers would be that they help you or solve some of your problems, but not all...no one has yet developed or come up with the ultimate organizer / database / whatever format you prefer... I have tried them all. The market is totally geared an focused on Music or MP3. MP4 has kind of helped the video organizers some, by combining the MP3 and MP4 formats together. Here is the deal. I am a video editor...I create high end music video remixes, mainly targeted to DJs, VJs, bars, etc...I started out at a Movie Studio, worked on commercials, music videos...just about every aspect of the Media. I even produced Laserdiscs, back in the day before dvds finally came true. I am convinced that no software, as of today, exists...for people like me who have enormous movie and TV collections, so many external hard drives that I've lost count. But more importantly, there is no software that really focuses on the Music Video media format. There are some very good organizers that come close...but the music industry / entertainment / bar / club / DJ etc...as we knew it...has really been growing into the use of VIDEO as preferred choice for music entertainment. Guess What? There is no music video organizers or even close. Try to type in a few key words...and you will get lots of Movie software organizers. But then you have clips...you tube, Hulu, Award Shows you recorded from TV...even old VHS tapes you dubbed to DVD. Most importantly, of all the video categories: Music Video has been neglected the most. 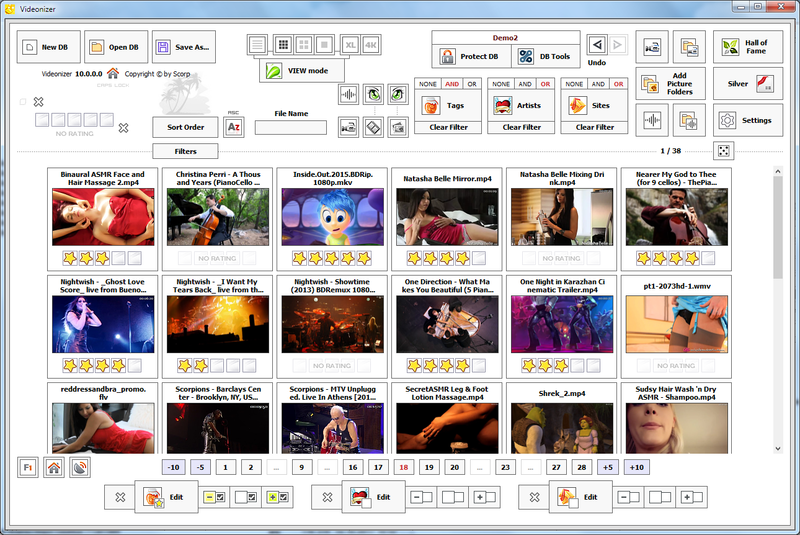 So for now, our first product will be a Music Video Organizer....using ACCESS. But the sweetest part is...you do not have to know how to use Access, we are making it super User friendly....Going to hide all the graphs and tables...make it beautiful, colorful, with buttons and big numbers... Very simple. Whether if it's on your desktop near all your DVDs and hard drives OR if you're a mobile DJ and you are now working (mixing) off your iPad or laptop - then you take it with you wherever you go. I hope this interests you...and even interests some of you more interested in other features of my concept of organizing your collection. I am not trying to compete with anyone who sells similar products. But all of you, especially in the music business, knows there is nothing out there to help you control your constantly growing music video collection. Has anyone found something good? I still haven't found a good program. Also, does anyone has an answer to this question proposed: "...has anyone out there worked at a TV News station? What software app do they use when they have a need to replay and therefore find a 5 minute video clip that was aired 3 years ago? I'm sure they are using some kind of video organizer database that has all kinds of video clips catalogued. What app do they rely on for fast retrieval of any video clip they need to find among thousands of video clips? Any help will be greatly appreciated." "Real" newsrooms use systems like Avid Interplay which is scalable. Is that what you are looking for? I don't need it that robust but something like it. I've been looking for a video manager for my personal videos (not for Movies, TV, etc...). If I want something for Movies and the like there is a ton of good software, such as XMBC. What I want is the ability to tag videos, mass edit/create tags as well, backup the database, and have redundancy if a file is moved so that I can either point the program to the right place or the program will search for the file in some manner. I had tried it but it was still a little clunky (for just videos to me), along with Sony's Media Manager, but I've been kicking around the idea and sucking it up and using it. Bridge is better than Sony's. Thanks for the suggestion. Oh, and in the past I was looking for a solution on both Windows and Linux, so that was a limiting factor, but I am at the point I don't care as much as finding a good solution. Adobe seems to fail when with my video collection of 1000s of files because it uses a lot of HD space, over 100 gigs. I'm testing Daminion now and it seems better but I need to verify how it saves tags. I've been using this for years...very configurable... & nice interface. is nothing to laugh at. Thank you for the suggestion but CollectorZ doesn't seem to have the support I need. I'm not dealing with movies or tv shows. More family videos, project videos, and footage for video filler. One is Speed, but Also, Vee-Hive suffers the same issues that Daminion does, which has been the best solution thus far (for me), and that pitfall is there isn't a way to save tags to files that sticks, so I can read them again from the program. The problem I have is sometimes I need to rename several files (100s even), or move them around from folder to folder as I decide to organize better or a project deems the merit to spend the effort. With Daminion I can get around everything but the renaming issue. See, I don't want to have to relink 100s of files, nor do I want to feel stuck with the files once I've added them to a database. I was hoping to use an organization program, in conjunction with the ease of using filenames and folders. Let me know if I'm mistaken about Vee-Hive. Aah, OK. I see that you have a strong requirement for underlying file-system management functionality (move, rename, delete, etc). Vee-Hive tries where it can to move away from the file-system so it probably isn't what you are looking for. The Vee-Hive world-view is that the file system doesn't matter since it is the window into all of the underlying files, regardless of where they are stored. As far as embedding tags within the meta-data of files themselves is concerned, my own personal take on this is that it is do-able BUT there is no standard in terms of what this embedded structure should look like. Consequently, I have always been opposed to doing this (or even attempting it) in Vee-Hive since (in my view) it's a pointless exercise if other software is unable to make use of that embedded data. Hence, in Vee-Hive, all user-meta-data is externalised (within a Vee-Hive Library). Oh, as far as speed in concerned your comment surprises me since I found Vee-Hive to be much faster at results-fetching than Damion and a few other similar programs. Or were you referring to some other aspect of the program? I can't seem to get away from the file-system management, but I've been trying to expand my way of doing things, so maybe in the future. For meta data Damion uses either their own or XMP, but the problem I've had is I can see it write the XMP data but if I re-import something it won't read the XMP data, even if I can still view it in the program (tag data). I don't mind not having tag data, but like with the file-system stuff, but I need a way of maintaining some of the data if I need to re-import things. When I was doing a comparison of importing with Vee-Hive and Damion 3.3, and also search fetching, for me at least Damion seemed to be the winner, I wouldn't say by miles but I had noticeably more lag on Vee-Hive. I wouldn't say Damion is smooth sailing, but no product I've tried has been with 5-10K files (depending on my tests). Thanks for pointing out the XMP stuff - I haven't looked into that area of meta-data for years and wasn't aware that this was now an ISO standard! Regardless, it is one thing to define a standard for embedding the data but something else entirely to ensure that that data is shareable across applications unless all such applications share a common approach to using it. Example: Anybody can create and embed a tag called 'French' but what would it mean to another application if it were to read that tag unless there is a defined context for it. French Language? French Nationality? French Dressing? Answer: Not very much, because there is no standard ID's for those tags that could support such an interpretation. And that's before one even considers the place that a tag might occupy in a hierarchy because these might be use-case specific and entirely meaningless to anything but one applications or user's point of view. It's not as straight-forward a problem as simply getting meta-data inside a file, however attractive a proposition that may seem. Having said that, it does of course work very well for music files since all we want to say about them is pretty much the same regardless of application; i.e. genre, artist, year, etc. Just letting you know, Videonizer 4 with multimedia view and animated thumbnails for items has been released. Last edited by ScorpBY; 29th Oct 2017 at 14:30. Earlier this year I released Video Hub App - software aimed directly at managing a video collection numbering in thousands of videos. The feature it brings that others lack is previewing screenshots from the file by hovering over the thumbnail (or viewing it as a filmstrip). It's super-fast, has advanced search/filter options, and works on PC, Mac, and Linux. I had a little play with your app and it has some nice features, in terms of visual effects, but not much else of substance that can't be found in more mature programs. The tagging system, for example, is fairly primitive and, if managing many thousands of videos, this is probably the most important thing that such a program should have, IMO. Take a look at Vee-Hive if you want to see how a powerful tagging system works. The same could be said of your filtering; the only thing that is permissable, currently, is positive inclusion, i.e. there is no implementation of AND and OR-type operations. Thank you for the detailed response @VideophileII -- I appreciate feedback. There is an option to have inclusive / exclusive (AND / OR filters) for both file name and folder name (since many people organize by folders too). There is also an option to exclude files. The current "tags" are just auto-extracted from file names and are not meta-data for the video, but since it's the #1 most-requested feature I'm thinking of adding them in early 2019: future features roadmap. it's feedback like yours that helps me improve the app -- cheers! Yes, I see how your current tagging works. But having auto-assigned tags is not a particularly good idea, IMO, unless you allow the user to create the rules for when they are derived and assigned. Under your current approach, the user is left to remove all of the unwanted tags that your auto-generation process creates (potentially over-and-over again). In the true sense, they aren't even tags at all; they are simply a readily-accessble means of identifying files with a particular string in their filename, which is already achievable via your text-input box. Thank you VideophileII for offering to answer questions! And awesome job with making Vee-Hive -- it's full of features! With my files, I've always been resistant to tags -- they result in 'vendor lock-in' -- typically you can't take them to another software. There is a lot of start-up costs (unless you start your collection very small) in tagging all the files. Personally, I've opted for minimal tagging directly in a file's file-name, but that's unwieldy with many tags. I'll think long and hard about how to implement tags well, might take some inspiration from Vee-Hive (though it's a bit too advanced for what I'll likely aim to achieve), and possibly send out a survey to people who bought my app to see if they want to give feedback. I'll likely try to tackle tagging in first quarter of 2019. With my files, I've always been resistant to tags -- they result in 'vendor lock-in' -- typically you can't take them to another software. However, the world moves on and there may come a day when standards emerge for such things. Hopefully, I've designed things flexibly enough in Vee-Hive to be prepared for that and, in the mean-time, my users have access to tagging functionality. As a matter of fact, I have successfully migrated a Sony Vegas Library into Vee-Hive, in the past. Besides that, my back-end is completely open (just a SQLite database), so anybody can extract what they see fit and import it into whatwever format they like (if they have the requisite SQL knowledge). Last edited by VideophileII; 10th Oct 2018 at 08:06. Video Collection Organizer with Frame Preview?